The UENO WELCOME PASSPORT is an All-in-One admission ticket that allows you to visit the following 13 exhibitions and galleries (one admission per place):Tokyo National Museum, National Museum of Nature and Science, The National Muesum of Western Art, Ueno Zoo, Kyu-Iwasaki-tei Garden, Shitamachi Museum, ASAKURA Museum of Sculpture, Ueno Toshogu, Sogakudo of the Former Tokyo Music School, as well as selected exhibitions at Tokyo Metropolitan Art Museum, The Ueno Royal Museum, Calligraphy Museum and The University Art Museum (Tokyo University of the Arts) . For the “One-Time Special Exhibition Admission Ticket” (3,000 yen), you can choose one additional special exhibition. It also includes a map of Ueno so that visitors can explore the area while hopping around the museums. 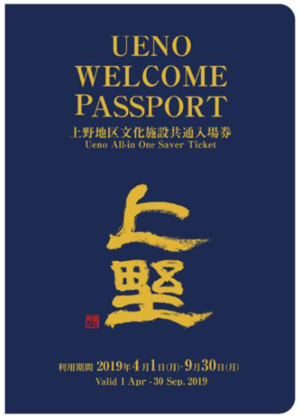 Savor a unique experience at Ueno's renowned art galleries and cultural museums with UENO WELCOME PASSPORT. Embark on this journey to rediscover the allures of Ueno full fo unforgettable memories. With the Special Exhibition Ticket (One-time) + Permanent Exhibition Combo (3000 yen),get a one-time admission to a designated special exhibition from the following. Shops and ticket counters at the respective facilities listed on the Ueno Welcome Passport (Includes exceptions), Tokyo Metropolitan Art Museum Museum Shop, the University Art Museum (Tokyo University of the Arts) Museum Shop, The Ueno Royal Museum Museum Shop, Ecute Ueno, ASAKUSA Culture and Tourism Center, Matsuzakaya Department Store (Ueno), Ueno Marui, Keisei Information Center (Narita Airport), Tokyo Tourist Information Center (Tokyo Metropolitan Government Office) and others. * The places above are subject to changes. Please refer to http://ueno-bunka.jp for latest updates.